Betty Thompson Morton grew up in Winston-Salem. Her company is Betty’s Good Cooking in Kernersville where she is a food coach, cooking instructor, cookbook author and a media coach. She is a graduate of North Carolina Central University with a Foods & Nutrition major. Betty recently graduated from the Triad Community Kitchen at the Second Harvest Food Bank with a certificate in Culinary Arts Skills Training. 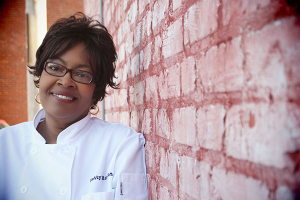 In 2011, Chef Betty returned to the Triad from Richmond, VA, where for over 20 years she was manager of the Reynolds Wrap Test Kitchens. For 14 years Betty appeared in over 25 Reynolds Wrap product commercials. I bet you remember those two ladies in white lab coats! Her career took her from her first job the Betty Crocker Test Kitchens in Minneapolis, to the Quaker Oats Test Kitchens in Chicago. Currently Chef Betty teaches healthy cooking classes at The Stocked Pot Cooking School and Wake Forest Baptist’s Best Health. She volunteers and helps teach children and parents to cook as a part of Michelle Obama’s “Chefs Move to Schools”. Chef Betty also teaches healthy cooking demos at Triad churches, businesses and for organizations at Winston-Salem State University and Wake Forest University. In 2002, she co-authored “Pat & Betty’s No-Fuss Cooking” cookbook. She is writing a cookbook in tribute to her parents who taught her how to cook and to love healthy home cooked food.